In arguably the finest text ever written in the philosophy of social science, Abraham Kaplan emphasizes what unites the behavioral sciences more than what distinguishes them from one another. Kaplan avoids the bitter disputes among people doing methodology, claiming instead that what is important are those qualities intrinsic to the overall aspirations of the social sciences. He deals with special problems of various disciplines only so far as may be helpful in clarifying the general method of inquiry. 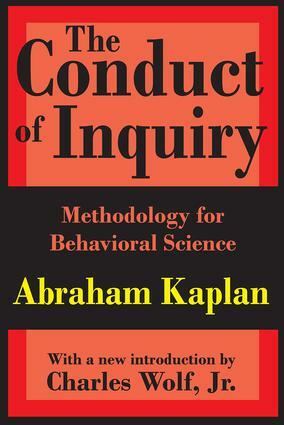 The Conduct of Inquiry is a systematic, rounded, and wide-ranging inquiry into behavioral science. Kaplan is guided by the experience of sciences with longer histories, but he is bound neither to their problems nor to their solutions. Instead, he addresses the methodology of behavioral science in the broad sense of both method and science. The work is not a formal exercise in the philosophy of science but rather a critical and constructive assessment of the developing standards and strategies of contemporary social inquiry. He emphasizes the tasks, achievements, limitations, and dilemmas of the newer disciplines. Philosophers of science usually choose to write about the most fully developed sciences because problems are clearer there. The result is ordinarily of little benefit to the behavioral scientist, whose task is clarification of method; here the precedents and analogies of physical science are obscure or inappropriate. The Conduct of Inquiry goes a long way in drawing upon the strengths of social research insights without simplifying the common concerns of the scientific enterprise as a whole. As Leonard Broom noted when the book initially appeared: "Kaplan fills a gap and does so with admirable clarity and often engaging wit. It lacks pomposity, pedantry, and pretension, and it is bound to make an impact on the teaching of and, with luck, research in the behavioral sciences."